When I travel, I never seem to do things the traditional way. Take a trip to Greece. It typically conjures up images of baking on a sun drenched beach or sitting aboard a sailboat as you hop from isle to tranquil isle. Instead I chose to bicycle for several weeks in mountainous Central Greece and the Peloponnese peninsula. My goal: to see the authentic side of the country that many visitors overlook. The terrain that dipped and rose dramatically a multitude number of times each day revealed a land of contrasts. Riding from Glifada to Sounio, I was overpowered by the pungent scent of eucalyptus trees one moment. The next, a warm salt breeze brushed against my face. Narrow mountain roads zigzagging through the olive tree-coated valleys then wandered through scented dense pine forests. Riding through a lush valley towards the coastal town of Nafplio, I took a high road that was very reminiscent to many a road I biked in the Colorado Rockies, complete with jagged, snow dappled peaks. The generosity of the locals set the tone for the trip right from the beginning. As I took a breather on the side of the road, a man selling fresh figs, sensing my parched state, gave me a handful. The plump, moist fruits were better than any snack I would've carried. Grapevine-lined roads to Epidauros sliced through fertile plains that were crowded with pomegranate, orange, fig and walnut trees. Riding through this cornucopia, I often encountered farmers who'd offer me a bunch of grapes they were loading into a small open bed truck. Even when the usually bright weather turned grim with a blustery downpour on my ride to Livadia, my spirits soared when I pulled into a garage for shelter and a young man, seeing my muddy gear, ran out to hose down my bike. Then, a shopkeeper brought me a chair to sit on as I dried off outside his shop once the rain stopped. A woman next door even offered to dry my soggy clothes. Later in the trip, on the long road to Olympia, as I paused to ponder the map, a woman walked into her garden and handed me several English cucumbers that quickly quenched my thirst. Every day provided a wealth of surprises, as long as you were ever mindful of your surroundings. Outside the town of Arahova, luckily I was very attentive and spied a clutch of brightly painted houses perched high on stone outcrops. Zipping down a steep section after Kalavrita, I kept my eyes on the sheep in the middle of the road and almost missed an ancient monastery hugging the side of a windswept mountain. 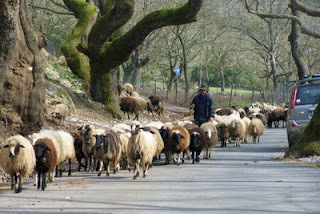 Near many mountain villages, I shared the road with a menagerie. Sheep, mules and even chickens forced me to slow down as they crowded the road ahead. On other narrow winding roads, it wasn't unusual to see a black clad old woman ambling down the road aside a mule. A three-mile side trip from Sparta led to one of the most striking sites: Mystra, a deserted Byzantine city set amongst the mountains. Numerous footpaths weave through this stone city whose fortress dominates the 2,000-foot summit. Meandering through this monumental town, I explored the octagonal domed church of St. Theodori, numerous other churches and fresco-laden chapels and lingered at the summit for the views of the snow-capped peaks and pine forests. Every morning, in even the smallest villages, I followed the aroma of fresh baked bread, almonds and cinnamon to a zaharoplastio or pastry shop. And it certainly was not all about baklava, though honey, nuts and phyllo dough were major players. Among the dozens of sweet treats, I found small chocolate or vanilla iced cakes stuffed with rich custard, shredded pastries with nuts, and honey puffs and honey biscuits. In the seaside communities like Nafpaktos, fresh squid was a real treat. I passed fishermen who were slamming them on the coastal rocks as a tenderizing technique. In the nearby tavernas, these freshly-caught squid were served fried and drizzled with lemon juice. No need for fancy dipping sauces. It was easy to spend two hours at lunch where I never tired of Greek salads with red ripe tomatoes and cucumbers picked in the gardens behind the tavernas, and chunks of firm tangy feta cheese; as well as warm crusty bread and thick creamy sheep's milk yogurt topped with rich honey. My next trip to Greece will surely be to check out the dozens of islands that pepper the Aegean Sea. But there's something to be said for getting away from it all by cycling through Greece's many mountain villages. Thanks for sharing this trip. I was right there, riding along with you. Hi Alexandra, Thanks so much for your kind feedback. Glad you enjoyed the post. What an amazing trip - and definitely not your typical Greek trip. I could almost taste the figs! Hi Martha and me, Yes, I defintely love the atypical. And the gracious Greek people made the trip that much more delightful, complementing the fab scenery. This sounds absolutely incredible. What a wonderful way to see things you would normally have missed from the native people and food to the scenery. I recently went to Napa Valley and rode a bike through some parts - truly a fabulous and different feel. Hi Sheryl, I'm so glad you enjoyed my post. And also glad that you had a chance to experience a different side of Napa Valley from the saddle. I've bicycled through Calistoga and loved it as well. What an amazing way to see Greece. I especially enjoyed how you were able to follow your nose and find some sweets. Greece has to be one of my favorite countries in the world. Hi ReadyMom, Oh, yes, I always follow my nose for sweets. I'm a confirmed chocoholic but adore non-chocolate desserts as well. And Greece was chock full of wonderful pastries. Oh How I would love to bike through Greece! I've been wanting to do a biking holiday for years, but I think I'd have to choose somewhere flatter than Greece. You must have amazing calves. There is a lot of talk of developing a country end to end bike route here in New Zealand at the moment and I hope it goes through. What a perfect way to really get to know the country from the inside. Hi Peggy, Thanks for comments. If you need any travel help on a future trip to Greece, let me know. I've got lots of ideas. Hi Peggy, That'd be great if there was a long-distance bike route in NZ. Would you let me know if that moves forward? I'd love to ride it. PS I've got a lot of cycling endurance but I'm a slow rider. So I can do very long distances in one day, but it takes me awhile. Hi Meredith, Yes, I always believe that the real way to see the true nature of a country, its land and its people is by traveling the slow way: by hiking, walking or cycling. These photos are gorgeous. I wish I could afford a trip to Greece. Hi Jennifer, Thanks bunches. The trip ended up being fairly economical, except for the airfare, of course. 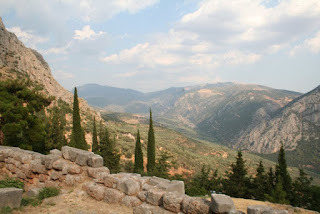 I stayed in small guest houses, bicycled and ate in small tavernas. 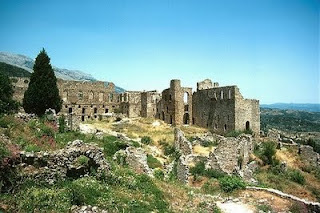 Thank you SO MUCH for writing about the Peloponnese. I always advise people to save the islands for a 2nd trip--or take a short day trip to Hyrda and Poros from Athens, but see the REAL Greece first. You don't talk about the ancient sites, but people who go for that, can find so much of interest in the Pel. Next time, if you REALLY want to do something different, head for the Mani Peninsula,with its strange tower houses and also Momenvasia--and island redoubt from the 14th century. And Jenifer--once you get out of pricey Athens, Greece is amazingly cheap--specially the way that J did it. Hi Vera Marie, Your comments and suggestions are great. I'll totally have to check out the Mani Peninsula and Momenvasia. Sounds amazing. No, I didn't talk about the ancient sites but I saw plenty of them on my trip. It's great rolling into these places and wandering among the ruins after sitting in the saddle all day. Amazing! We also like to travel and hit the non-tourist hot spots. I have always said that our kids force us to visit places in different ways. They move at a different pace, get tired quicker, are not interested in seeing the local museum.. but we do tour plenty of parks, walk leisurely down streets and peer into windows that we'd miss if we were cruising by in a cab. thanks for taking us along on your journey, Jeanine. reminds me of off the beaten path times I have had hiking -- especially the sharing the road with menagerie part! Hi Claudine, I'm so glad we both like to hunt out the less visited sites. Yes, traveling with children can certainly allow you to see things from a totally different and wonderful perspective and to visit venues you might normally pass up. Hi Kerry, Yes, hiking can often involve sharing the paths with all manner of menagerie as well. On my hikes in Corsica, we found wild boar, chickens and cows. I've been to Greece before but never seen it like this! Thanks so much for the post. Hi Jen, Thanks for your kind comments. You never know what you'll find when biking the backroads, as I like to do. I've been thinking about this post for the past several days and came back to re-read it. It's just such a fabulous journey, and I'd love to know more. Are you writing a lengthier piece on this elsewhere? I'd love to know how you planned it? Were you solo? Did you encounter many other travelers? How did you arrange accommodations in advance, or did you just show up? I love trip report-type articles like this and your is very inspiring -- I was just wondering if you were planning to publish this story with more detail somewhere else. Hi Lauren, Thanks for your enthusiastic comments. Yes, I've been Pitching it around but no bites, yet. I'm sure a longer version will find a home, though.